May River Theatre brings a classic story with an amazing musical score to its stage this summer with Little Women the Broadway Musical. Based on the classic novel by Louisa May Alcott, this musical version brings the beloved March family to life with book by Alan Knee, lyrics by Mindi Dickstein and musical score by Jason Howland. In her directorial debut with The May River Theatre, Michelle McElroy makes the leap from actor to director and even beautifully costumes the show. McElroy is supported by veteran musical director Beth Corry and an amazing cast and technical crew. Jean White (Jo), Lauren Cleland (Meg), Shannon Hegarty (Beth), Caylin Campis (Amy), and Sonya Jacobs (Marmee) pack incredible talent into the March family characters that millions have grown to love. The four-part harmony of the beautiful musical score showcases these talented ladies’ vocal abilities. The supporting cast members include Daniel Bittick (John Brookes) Logan Naddy (Laurie Lawrence), Steve Mason (Professor Bhaer), Susan Romero (Aunt March), Steve McElroy (Mr. Lawrence), Talia Boudjemaa (Hag), and Abby Jacobs (Troll). These actors represent a timeless tale of joy, love, and grief. 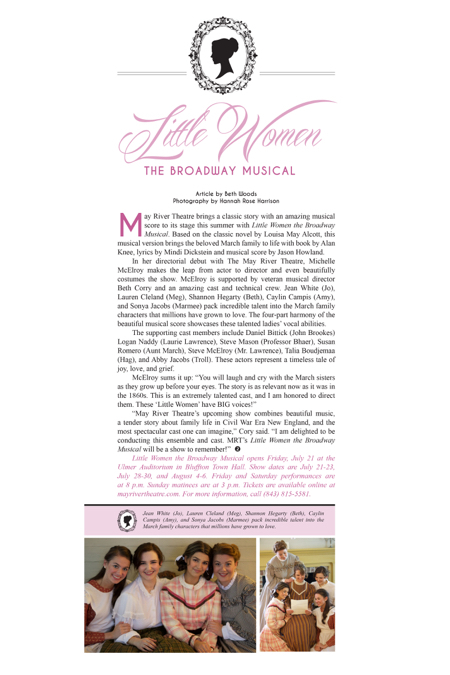 Little Women the Broadway Musical opens Friday, July 21 at the Ulmer Auditorium in Bluffton Town Hall. Show dates are July 21-23, July 28-30, and August 4-6. Friday and Saturday performances are at 8 p.m. Sunday matinees are at 3 p.m. Tickets are available online at mayrivertheatre.com. For more information, call (843) 815-5581.